Activists have launched a page on Facebook dedicated to addressing the rising number of hate-speech cases in Myanmar. 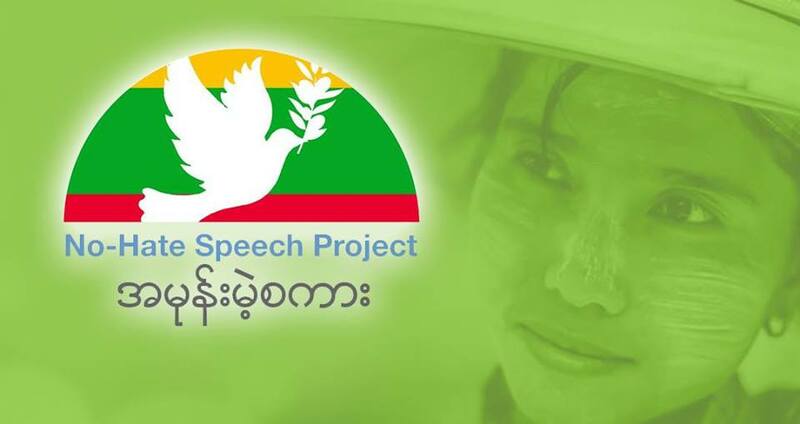 The “No-Hate Speech Project,” available in both Burmese and English, went live in March 2016 with the goal of educating Internet users in Myanmar about dealing with hate speech on social media. We believe it [is] wrong to deny any group or individual the right to speak out because we oppose their views. Silencing some while favoring others is not a recipe for building tolerance. So we will offer to platform and fairly examine and discuss the ideas and opinions of all. It is important to understand that not all hate speech is deliberate or intended as such: It is also important to realize that sometimes hate speech comes from an honestly felt fear of the unknown. Myanmar's semi-civilian military-backed government, which has ruled since 1962, implemented some reforms related to freedom of expression in 2010, such as removing media censorship and unblocking various websites. Last year, the electoral defeat of the country's military-backed political party helped cement many of these democratic reforms. Over the past six years, during Myanmar's political transformation, Internet connectivity rose from 0.2 percent in 2010 to 12.8 percent in 2015. But the improvement in digital infrastructure was also accompanied by a disturbing rise in hate speech. In particular, anti-Muslim statements flooded social media, which some analysts believe has contributed to the escalation of communal violence across the country. Some ultra-nationalist groups, such as Ma-Ba-Tha led by radical Buddhist monks, publicly incited hatred against the Muslim minority, especially the Rohingya ethnic group. A report published in 2015 by the PEN Myanmar association of writers revealed that hate speech is more pervasive than previously reported. The study also found that hate speech targets not only Muslims, but also members of the political opposition, human rights activists, other ethnic minorities, and even ordinary Internet users who have expressed negative attitudes about the government. Myanmar is an ethnically diverse country, but Myanmar Buddhists constitute the majority of the population. The Rohingya Muslims, meanwhile, are a stateless people who the government considers to be illegal immigrants. Our idea is that our religious leaders, civil society leaders, lawyers and the government will work together to create a law [on the issue]. The No-Hate Speech Project functions by identifying an original post that contains hate speech elements and then discredits the hateful statements by countering with facts and alternative viewpoints. Since the project launched in March, it has responded to hate speech that targeted Muslims, women, ethnic rebels, and foreign workers. Under the photo, Soe Naing wrote: “The sign impressed me. Give me a “Like” if you agree every area should be Islam-free”. At the time this post was spotted by this monitor, it already received 8289 Likes; 4234 shares and 517 comments. Those who argued against the prevailing comments included Htay Ko who stated: “I think you guys are so happy with this -but Buddha would be morose to learn how this contradicts his teachings. Posts like this can clearly lead to conflict rather than harmony and may incite hatred. Soe Naing has a total of 4914 friends and 21688 followers on Facebook. Our Anti-Hate Speech Project is working carefully with colleagues to investigate the background to this sign, whether it actually exists, and if so who put it up. 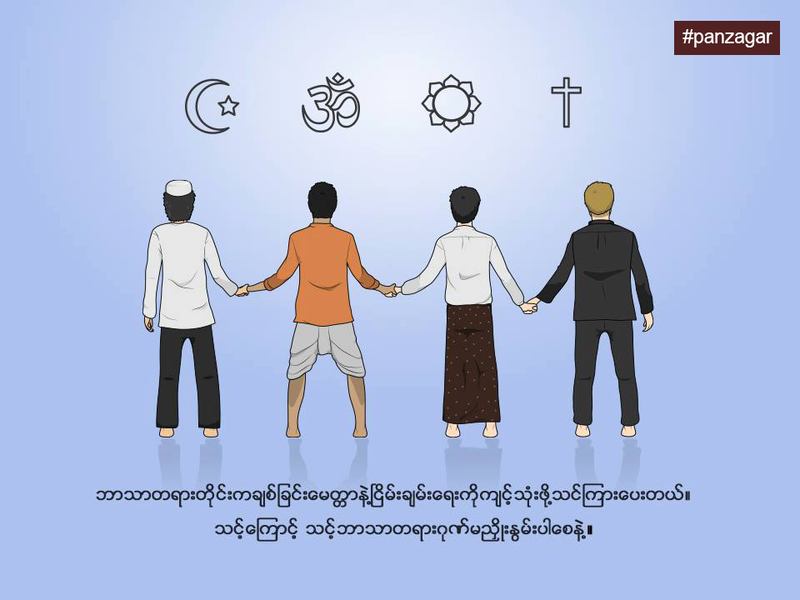 The No-Hate Speech Project is not the only group in Myanmar trying to tackle online animosity. As hate speech cases became more frequent, several initiatives have emerged to battle intolerance and discrimination directed at religious minorities. Last year, young people started a to promote diversity by encouraging inter-ethnic friendship among youths. On Facebook, there's also a group called Panzagar, which introduced “flower-speech” Facebook stickers. This year, some Facebook users started using the hashtags #‎Say_No_to_Racism‬ and #‎2016_OnlineCampaign‬ to fight hate speech. Many social media users have made posts to the one below, which is the work of activist Moe Thway, who appeals to the public for support against racism. Anyone who is against racism please upload this status.